Salary: Pay Band of Rs.9300-34800/- plus Grade Pay Rs.4200/-, all over the country. Education Qualification: Diploma or Degree in Civil or electrical or mechanical engineering. 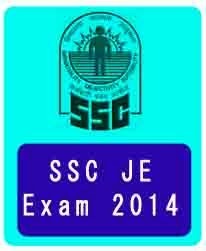 Selection Procedure : SSC will hold an all India level open competitive examination on 30.08.2015 for the recruitment of various posts of Junior engineer Civil and Junior engineer electrical in central Public Works Department (CPWD) and Department of Posts, JUNIOR ENGINEER (CIVIL), JUNIOR ENGINEER (ELECTRICAL & MECHANICAL), JUNIOR ENGINEER (Quantity Surveying & Contract) in Military Engineering Service (MES), JUNIOR ENGINEER (CIVIL & MECHANICAL) in Central Water Commission (CWC) and Farakka Barrage. After that those candidates who will declared qualified for written examination they will be call for an interview test. Written exam will carry 500 marks and interview test will carry 100 marks. Candidates can pay fee via SBI net banking, Challan form , Debit card, credit card, etc. In Part I registration, candidate will have to fill basic information. On submission of details, candidate shall be prompted to check the details and make any correction in the application.